In the physiological situation, cytokines are pivotal mediators of communication between the maternal tract and the embryo. 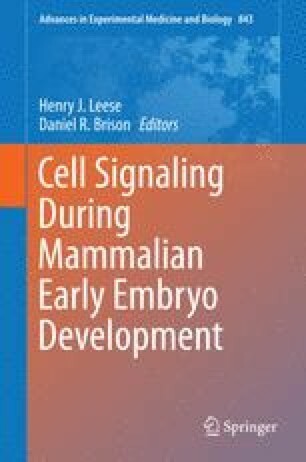 Compelling evidence shows that cytokines emanating from the oviduct and uterus confer a sophisticated mechanism for ‘fine-tuning’ of embryo development, influencing a range of cellular events from cell survival and metabolism, through division and differentiation, and potentially exerting long-term impact through epigenetic remodelling. The balance between survival agents, including GM-CSF, CSF1, LIF, HB-EGF and IGFII, against apoptosis-inducing factors such as TNFα, TRAIL and IFNg, influence the course of preimplantation development, causing embryos to develop normally, adapt to varying maternal environments, or in some cases to arrest and undergo demise. Maternal cytokine-mediated pathways help mediate the biological effects of embryo programming, embryo plasticity and adaptation, and maternal tract quality control. Thus maternal cytokines exert influence not only on fertility and pregnancy progression but on the developmental trajectory and health of offspring. Defining a clear understanding of the biology of cytokine networks influencing the embryo is essential to support optimal outcomes in natural and assisted conception. Sarah Robertson is an inventor on patents concerning utility of GM-CSF in IVF culture medium and receives royalty income from ORIGIO A/S. Jeremy Thompson is a consultant to Cook Medical Pty. Ltd. and has patents on methods for in vitro oocyte maturation.